One feature that distinguishes an aging face from that of a young person is the lack of facial fat. As we age, the subcutaneous fat that gives young faces a rounded youthful appearance naturally diminishes, often giving the face a hollow or gaunt aspect. Performing cheek exercises help to build the apples of the cheeks, and therefore lift the face, and give it a more rounded, youthful look. Cheek exercises build muscle and improve circulation, which will also help your face regain a younger look. As well as aging, a gaunt face can also be caused by weight loss. If you are generally thin, it is only natural that this will also effect your facial fat, and therefore putting some weight on will help. 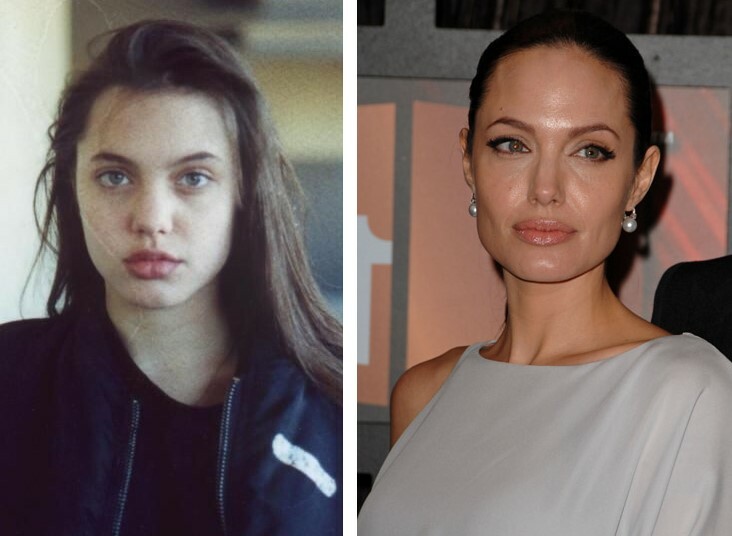 This is demonstrated by the pictures of Angelina Jolie below – the first picture shows her as she was pre-cosmetic surgery, and the second was taken when she was 33 years old. While she may the one of the most beautiful women in the world, her gaunt face does make her appear somewhat older than her biological years. Imagine a line running from each corner of your mouth to the tops of your ears. Use your thumbs and index fingers to grasp as much flesh as you can along the diagonal of the lines. Pinch the flesh and pull it away from your face. Move the corners of your mouth towards your temples as though smiling broadly. Hold the your mouth in the raised smiling position for several seconds. Repeat 20 times, at least every other day for best results. Sit up straight, with your shoulders held back and jut your chin forward. Place an index finger on the center of your chin. With your mouth open, wrap both lower and upper lips over the teeth. Look up at the ceiling while opening your mouth wider. Lift your lower lids into a squint. Hold the pose and smile, while pressing your finger into your chin to create resistance. Hold for 30 seconds. This is an excellent exercise to help build and lift the cheeks, and is part of Carole Maggio’s Facercise program. An easier version of the facial exercise for a gaunt face above, is described in Reinhold Benz’s book “Five-Minute Face-lift.” As above, draw the lips inward, and wrap them over your teeth. Raise the corners of your mouth toward your temples. Hold, and count to 10. Repeat a total of three times.